I am glad to be back from vacation and sufficiently recovered from the beginning of our program year to resume writing a bit. In a meeting some time ago, I was asked what traits I thought would behoove the Church to look for in potential new ordinands. Rather than entrepreneurial, forward-thinking, flexible, or the many other qualities that are desirable in any new employee, I think the Church is best served by finding men and women of the Altar – men and women who see the whole of their ministry offered in the life-giving exchange of the Eucharist. I pointed out that there are many ways one can serve. There are many ways one can care for people. There are many ways to do social work, therapy, social service, and the many other good and caring ways in which we minister to the hurting and the lost. A priest though has one role, one function, to offer the Sacraments. All of our other roles – teaching, healing, preaching, and more flow from the Altar. 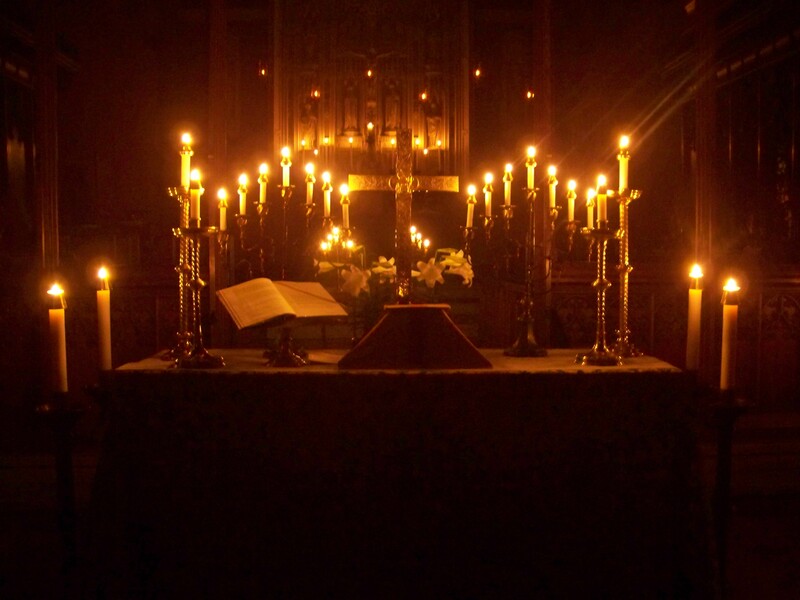 More broadly this is the whole ministry of the Church, which is His Body – we offer the means for men and women to find themselves in the Presence of the Holy One. The response of a colleague was telling – she said, “well you are a sacramental priest – so that makes sense for you. We need to be thinking of other ways to be priests too.” I could not disagree more. The Church is only the Church insofar as it offers the Sacraments with meek heart and due reverence. It seems to me that in the conversations about restructuring the Church, or a missional Church, or the many other ways we can imagine the Church changing that we are losing the simple fact that we first and foremost offer the Sacraments. If one visits the Episcopal Church’s website and clicks on “What We Do” you will not find the Sacraments. They are certainly listed under “What we Believe” but they are not just what we believe – they are what we do, who we are, how we are meant to be, and what we are called to be more of. We are initiated in baptism, fed in the Eucharist, express our devotion in confirmation, find forgiveness in confession, seek healing in anointing, embrace love in marriage, and some seek new forms of service in ordination. The sacraments walk us through the life cycle, drawing us to God and back to God and home to God. They are the foundation of ministry and unify the faithful in grace. The administration of the Sacraments cannot be unwoven from our pastoral function, nor from our teaching function, nor from social justice for it is through them that we are healed, united, and learn of God’s mercies. In our conversations about the life of the Church, I think we would do well to think of the bishops’ office not as an administrative or managerial one but again as a Sacramental one. 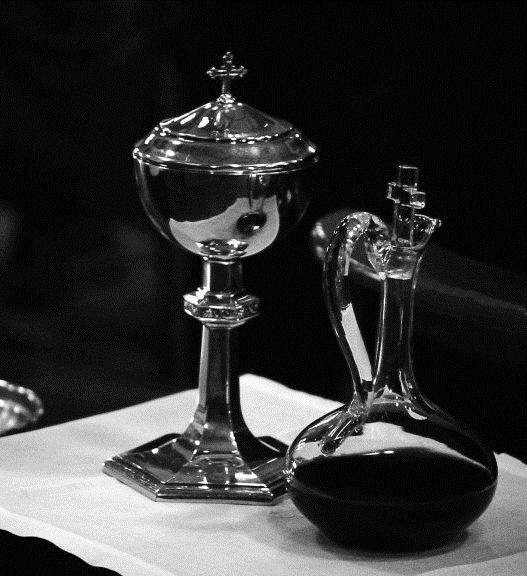 We would be well served by ordering our life along the lines of Eucharistic Servanthood. The Bishop lies at the center of our Eucharistic life and welcomes us into the apostolic band through the laying on of hands. The Church might benefit from an increased focus on our unity through the Sacraments with the bishops rather than viewing them through a power-politics informed adversarial lens (as seemed to happen too often at General Convention). Moreover, the bishops themselves would benefit from understanding their role through the traditional lens of Sacramental leadership rather than that of managerial acumen. Our priestly ministry is an extension of the bishop’s. Our Altars are extensions of the bishop’s Altar. The elevation of elected bishops is described by Hippolytus. He writes “All shall keep silence, praying in their hearts for the descent of the Spirit; after which one of the bishops present, being asked by all, shall lay his hand on him who is being ordained bishop and pray…” Obviously, we have a reference to what we would now understand as the laying on of hands and the succession of bishops. The role of the bishop is described in sacrificial, Eucharistic terms and his or her role and that of the rest of the church order are ordained by God; “You gave the ordinances in the Church through the word of your grace; you foreordained from the beginning a race of righteous men from Abraham, you appointed princes and priests, and did not leave your sanctuary without a ministry.” The bishop is the center of the sacramental life of their diocese with the priests assisting them in the administration of those sacraments. Our unity is found in this sacramental charge. Like priests, the bishop’s identity is rooted in the Sacramental life of the Body. God is enjoined to help his new bishop “…to feed your holy flock and to exercise the high-priesthood before you blamelessly, serving night and day; to propitiate your countenance unceasingly, and to offer to you the gifts of your holy Church; and by the spirit of high-priesthood to have the power to forgive sins…” The central role of the bishop, in Hippolytus’ work, is as a Eucharistic servant through whose auspices the Eucharistic unity of the church is promoted and preserved. Our role as priests is to stand in unity with and for the bishop as pastor of congregations under his or her leadership, strengthening and empowering a spirit of mutuality, ever-sharing in joys and sorrows. After this declaration, at the beginning of the service, the new bishop gives thanks that “you [the congregants] have held us worthy to stand before you and minister to you.” This passage is powerful in that it announces thanks and demonstrates humility at the beginning of the Eucharist for the trust of the congregants in the newly consecrated bishop. Surely this act of humility, as part of the Eucharist, demonstrates unity and reciprocity of service and obedience in the Hippolytan vision. Moreover it clearly indicates shared responsibility for the life of the community and reminds us that our ministry comes from our shared adoration of Christ in the sacraments as the whole church. The glory of the unified church is “the light everywhere diffused in one light” while the unity of the church is “unbroken.” Cyprian states that Christ commanded love and unity and asks “But what sort of unity, what sort of love, is preserved or contemplated by the mad fury of discord that rends the Church, destroys faith, disturbs peace, scatters charity, profanes religion?” As a Sacramental Body, we are to do the difficult work of preserving the unity of the Church not for the sake of the church but for the sake of His Body. This is not to make an idol of church unity but a call to struggle to make the Church a symbol of Christ’s love and God’s saving will. Cyprian’s vision of the Church can be summed up in the exhortation “There is one God and one Christ and one Church and one faith and one people fastened together into a solid corporate unity by the glue of concord. The unity cannot be rent, nor can the one body be divided by breaking up its structure; it cannot be broken into fragments by tearing and mangling the flesh.” It is unity held fast in God’s love. The love of one another is the response to God’s love for us in Christ and in creation. It is the love of Christ poured out on the cross that provides our model for prayer and engagement in the world. That love is modeled for us not only in Christ, but in the work of the saints as well who by their offering of themselves demonstrate the indiscriminate love of the cross. They represent the church at her best – they are the Church we are called to be. This kind of love is found in the Eucharistic life of the Church. Is there any act more radically democratic – calling us to shared self-giving – than the Eucharist? It is a point at which all take part in the divine and all people know that God loved them enough to make the sacrifice and to restore humanity in the fullness of time when we will share “a feast of rich food and a feast of well-aged wines.” (Is. 25.6) It is a point at which we truly experience creatio simpliciter and gain a sense of the preciousness of our inheritance in the abundance of God and Christ. In those moments, in fervent prayer together, we are provided a glimpse of the Christian defiance of the viciousness of the status quo. How can we, looking to the Lord present while being “transformed into the same image” (II Cor. 3.18), not recognize that the pain of others pierces God? If God abides in us and we are to abide in that love (John 15.4a, 9), then hardness of heart and blindness to suffering are profound sins against the indwelling God and we are called to offer solace and comfort – to offer word of God’s Presence. We stand in persona Christi and in persona ecclesiae together with those in distress. At the altar rail, we are transformed in joy and judgment into the Church. Our joy is unity and we are judged as we are called to ever more loving service. We share with all believers in a line of priests, prophets, martyrs, and saints. We share in the councils and witness of the church and take up the call of Christ to share in living Sacramental witness to God’s redeeming love. Lovely. I especially like the opening section, about the Sacraments as the heart of what the church does…. Your post picks up on a constant difficulty we have in TEC, I think: our tendency to act as if the basics of Christianity and of faithful praxis can just be assumed, or perhaps are really not all that interesting, so that we can leave them on auto-pilot and put most of our energy into leadership skills, or creative liturgies, or new proposals of one kind or another. This strategy has not worked well for us. think we’re about to hit bottom. Celebrating the Mysteries, the sacraments, and proclaiming the Gospel are what I was called to as a priest. None of the other stuff requires ordination. I think that some of our problem comes from confusing “priest” and “rector.” God called me to be a priest, the church made me a rector. The two are not the same by any means.